Heroism can be visualized in countless shapes and sizes, but perhaps nothing as mighty as the armor-clad warriors of the legendary Roman Empire. Dressed head-to-toe in protective gear and armed to the teeth with intricate weaponry, these men whom we tend to speak of in whispers lead lives of immeasurable valor—as they march into the fray and unleash massive bloodshed, their skills of combat somehow allow them to emerge from war with almost no wounds to their own flesh. No wonder Hollywood spent so much money on these kinds of stories back in the 1950s; such tales are the embodiment of everything epic. And yet the fact that they can be overly exaggerated does nothing to undermine our sense of amazement. The great days of Hollywood saw more than their fair share of these kinds of movies, among them two notables: “Ben-Hur” and “Spartacus.” Problem was, the productions themselves were epic on their own, demanding high budgets, large ensemble casts, thousands of extras and sets of boundless complexity to engulf the stories. Perhaps that is the very reason why such movies ceased to exist after the mid 1960s—studios grew scared of the elaborate requirements, and feared rejection from unpredictable moviegoers. It has taken almost 40 years for cinema’s filmmakers to realize, though, that putting a halt to them only intensified our thirst for more. 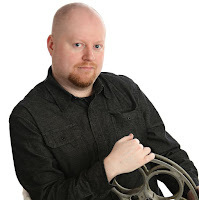 There’s no doubt about it—the epic is a sorely missed production, especially at a time when visual effects and digital technology could make the process cheaper, easier and faster. In the spotlight, out of inspiration from those old but timeless epics, comes Ridley Scott’s “Gladiator”—a refreshing (and much-anticipated) return to the world of some of the most astounding warriors ever known. Those who lived during Hollywood’s epic days will undoubtedly feel twinges of nostalgia upon seeing it; like its ascendants, the film is one of perplexing detail that is both stunning to look at and exciting to watch unfold. But there is more to be learned, perhaps, for those who were not alive during those days. The movie isn’t just a return to old traditions: it’s a bright new step forward. In those days, moviegoers were given heroes like Spartacus; this time, they are delivered one named Maximus. The wondrous warrior is played here by Russell Crowe, the man who deserved an Oscar for his portrayal of tobacco whistle blower Jeffrey Wigand in “The Insider.” His performance in “Gladiator” is just as good, if not better. Aside from creating a personality swarmed in psychological dilemmas and feelings, Crowe also manages an array of other attributes: a strong physique, knowledge of Roman weaponry and the ability to stage seemingly deadly combat (among other things). The role is a difficult one, indeed; only the old epic actors like Charlton Heston could probably identify. In the story (which is neither slow nor drawn out regardless of the long running time), Maximus is a Spanish general, clothed in exquisite metal armor and under the authority of the Roman Emperor, Marcus Aurelius (Richard Harris). After successfully leading his armies into battle against a group of barbarians, he meets with the emperor, who is aging and fears that his end is near (he makes a valuable point in one scene, saying that men who approach Death’s door tend to wonder if they had any kind of impact on the world). Rather than giving the emperor title to his eldest son, Aurelius asks Maximus, a man who has not been corrupt by politics, to assume the authority. 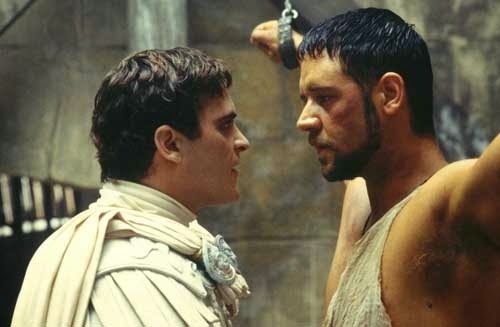 Before the official announcement is made and Maximus accepts the offer, however, the emperor is slain and the title given to his son Commodus (Joaquin Phoenix), who knows of his father’s intentions, and then orders the general to be executed. But Maximus, a champion of combat, is able to overthrow his executors and escape death. As he crosses uncivilized terrain on destination to his family, Roman troops march into his home and murder his son and daughter. When he arrives, struggling with a flesh wound from the near-execution, nothing is left but ashes and corpses. After a short mourning and burial, Maximus collapses, then reawakens to find himself on route to an African province where slaves are sold and trained to become gladiators. Meanwhile, Commodus assumes the duties as emperor, presuming that Maximus has been killed as instructed. His sister, Lucilla (Connie Nielsen), hides her grievance over the passing of her father so that she can help guide her brother through the affairs of state (Aurelius says early on how much he had wished his daughter were a boy, so that she could take the role of emperor when he died). The senate pounces on the new authority with accounts of the plague showing up in and around Rome, but Commodus puts them aside and opens a 150-day tournament of games, hoping that bad news will simply float over his head. One of these games, the tournament of gladiators in Rome’s vast Coliseum, will have a slight impact on the future of Rome’s rule, as the presumed-dead Maximus leads his new comrades out of Northern Africa and into the arena, in search for vengeance over the death of his family. The acting is first-rate. Besides Crowe’s success as a person of both physical and mental superiority, Connie Nielsen has a strong presence as Lucilla, a woman who cares about her family and the safety of the people, but is unsympathetic towards her brother’s untamed struggle for holding onto Rome’s highest jurisdiction. Richard Harris as the old man in search of a loyal replacement to his title is completely transformed, while Joaquin Phoenix is extremely involved in creating a hostile but cowardly man out of Commodus. If “Gladiator” is remembered at Oscar-time, expect a round of nominations for these thespians. Director Ridley Scott, who made “Alien” and “Blade Runner,” is in love with details, and builds us a movie that is steeped in rich textures, yet bursting at the seems with suspense and pathos. As gladiators are coerced into confrontations that end almost always in death, the audience is engrossed by both their uncertain outcomes and the images that represent them (the elaborate cinematography exhibits a sunlit arena filled with cheers and smiles at the sight of bloodshed). Likewise, the sharp overcast that is seen when Maximus leads his soldiers into a massacre on frigid landscapes is just as breathtaking, shot in hues of blue that underscore fine points of menace and destruction. Most films that adopt similar visual styles, particularly modern sci-fi flicks, fail because the tones are either too grainy or too dark. The gloomy imagery in “Gladiator” is some of the most distinctive I have ever seen, granted the violence is extremely gratuitous and revealing. The “R” rating is well deserved. At the end of the film, Maximus finds peace in his vengeance and is canonized by Rome as a savior to always be remembered. So should we all remember this proud and spectacular motion picture, which is not simply one of the best of the year, but one of the best ever produced. Those who criticize it for being less than acceptable have apparently forgotten the true spirit of Hollywood epics—this carries the significance, the energy and the passion as all the masterpieces of that unforgettable era. And if “Gladiator” is any clue of things to come, summer 2000 might be a better movie season than what we first suspected.